NICE AND EASY: What is a multiswitch? It’s sort of a traffic system for satellite TV signals. Multiswitches were born out of necessity in the early days of satellite television, and they’re still around today. Every modern satellite TV system has one, although they are often built into the dish itself. Let’s take a look at this modern marvel and how it does what it does. A multiswitch is more than just a splitter, although at its heart it’s basically a splitter. The purpose of a multiswitch is to allow more lines to come out of a dish than it’s designed for, and to allow more programs to be available than are possible with simple satellite reception. In the early days of satellite, basically you put up one dish and pointed it and that’s all you did. However, people wanted more. They wanted hundreds and thousands of channels. This would have taken up a lot of space in the electromagnetic spectrum, more than was allocated for satellite TV. Something had to be done. The red signals go left and right. The blue ones go up and down. So, they don’t interfere with each other. With polarization all of a sudden you could choose between two different signals on the same frequency, but you then had a problem. You had two different kinds of signals coming down. If you use a simple splitter then you get one or the other, the red or the blue. Polarization only works in the open air and not over a cable. So, satellite manufacturers came up with a set of switching signals involving voltage and frequency, to allow you to select between not only two signals from the same satellite, but from multiple satellites as well. (That’s really a topic for another article.) The purpose of a multiswitch is to figure out which signal you really want and put only that one on the line. If you have six lines in (which is common in satellite TV) you could have 8, 16, or even more lines out. Each would have only one kind of signal. In this animation you see that any of the outputs can have any signal on them. The multiswitch makes it happen. The single-wire multiswitch is an evolution in multiswitch technology that’s designed to make installation easier. With a traditional multiswitch, you needed one cable for each receiver, each run to the multiswitch. This made it really difficult and expensive to add a line on one side of the house if the multiswitch was on the other. Since you can’t use splitters with traditional multiswitches, it didn’t matter if you already had a line close by. The Single-Wire Multiswitch (SWM) fixes that. It’s sort of a cross between a multiswitch and a modulator. Instead of simply putting one signal on each outgoing cable, a SWM can put up to 21 different signals on the same line. This is done by assigning a frequency range to each receiver, known as a “SWM channel.” Whatever content is requested, whichever signal is needed for that receiver, it goes on that SWM channel. This means you can use a splitter to send the line to another receiver, and it will just pull another SWM channel. 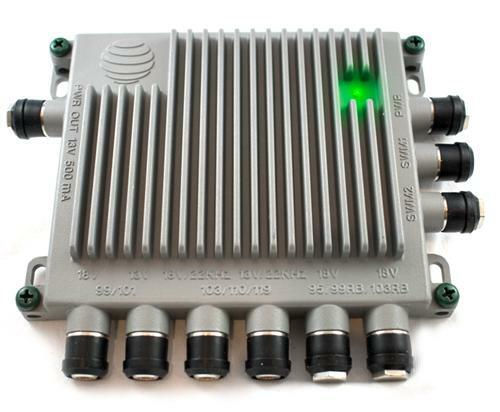 DIRECTV is the only satellite provider to use SWM technology, and they use a variation of either 8 channels per wire, 13 channels per wire, or 21 channels per wire depending on the level of technology. This makes installations a lot easier and more economical. Modern multiswitches also block out a portion of the wire’s electromagnetic spectrum for MoCA. MoCA is the term used for network connectivity over a coax cable. It’s how a Genie communicates with clients, and how a Hopper communicates with Joeys. Reserving this frequency range makes it easy to wire the system. Without MoCA and the multiswitch working with MoCA, you’d have two completely separate wiring runs: one for the satellite receiver and one for the client boxes. Which multiswitch is right for you? Generally speaking there is usually only one multiswitch option for most US customers. DIRECTV customers will use a DIRECTV SWM of some rt, while DISH customers will use one of two variants of the DP multiswitch. If you’re not sure which one you need, contact Solid Signal at 877.312.4547 to learn what you should buy!